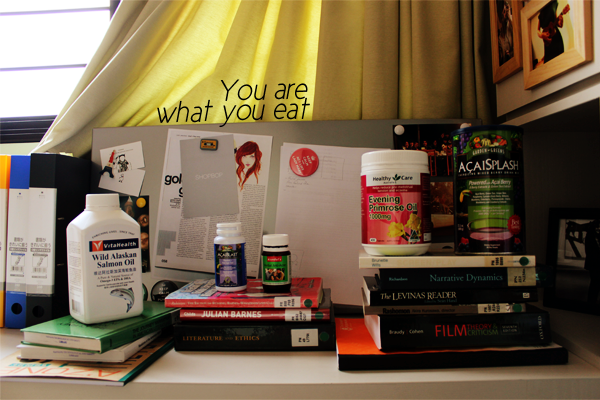 Quite recently, I have decided on a list of supplements which I want to take regularly from now on. For some, I have been taking them for a while now. Though, of course there would be periods when I forgot about their existence completely. Heh. Anyway, here's my list! This belongs to Mum and I just decided to pop them along with her. It's a pure and natural source of Omega-3 EPA and DHA. This helps to support cardiovascular and joint health. Nira, who has the most amazing skin, noted that this helped her with blackheads and whiteheads (Read her entry here.). I started on this only recently and got to know about it through Vivian. She tweeted that it helped her with her back acne. Herbal Anti-Acne is a natural combination of herbs formulated to prevent breakouts and help troubled skin from within. Burdock and Red Clover help clear the bloodstream of toxins. Echinacea supports the immune system. Marigold, Celandine and Burdock act as anti-microbial agents to help reduce bacterial growth on skin. Sarsaparilla and Red Clover contain natural phystosteriods that can help balance hormonal changes and have anti-inflammatory effect. I'm halfway through my bottle and my back seems to be clearing up quite a bit. I have also been applying Eucerin's DermoPurifyer Creme-Gel and Belif's The True Cream - Moisturizing Bomb quite liberally. This is also Mum's. Evening Primrose Oil is said to be good for relieving premenstrual tension and eczema. I have probably taken this the longest though I have yet to see any visible effects. But one thing which I have noticed is that I don't get cramps anymore and my period is more regular. It could be because I manage my stress better now (Or the fact that I have less to study. Haha.) though. But I don't see any harm in taking this so I'm going to carry on. This serves as my daily source of antioxidants. I was reading Yvette's blog when I noticed how glowy her skin was and asked her for her secret. She takes a lot of berries, as well as AcaiSplash. I don't really eat fruits (Not that I hate them. They are alright and I love watermelons but they aren't the things I reach out for when I want to chew on something. ), so I thought I got myself AcaiSplash. AcaiSplash is a concoction of berry extracts like Acai Berry, Raspberry, Lycium, Bilberry, Bluebery, Elderberry, Blackberry and Cranberry, combined with Grape Skin, Green Teat, Cherry and Pomegranate extracts. It comes in the form of powder and all you need to do is to mix it with water and slurp the berry-sweet drink up. 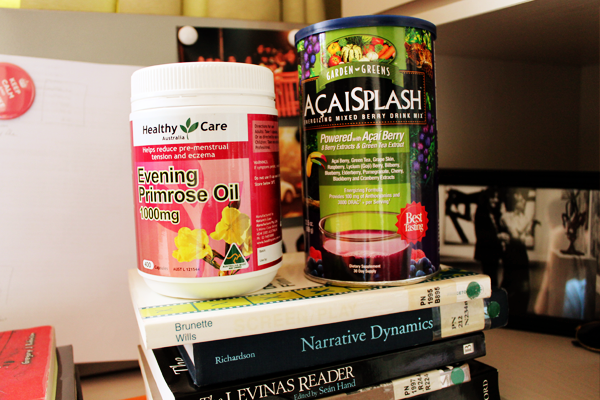 AcaiBlast is AcaiSplash in pills. I decided to switch to it because I didn't want to take more sugar than necessary. 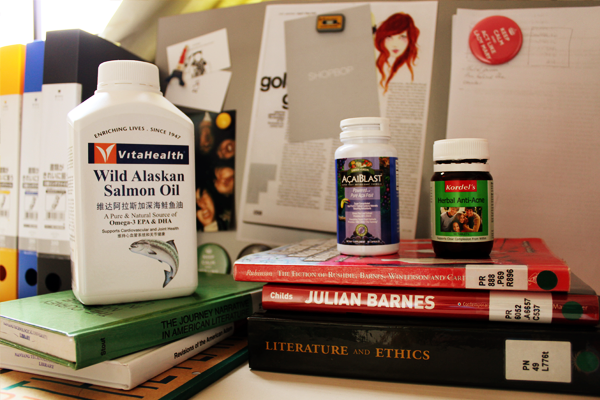 On top of these 4 supplements, it is a habit of mine to gulp down a glass of water the first thing in the morning. I try to eat a banana and half a Hawaii Papaya every day too. (: And I have this application on my iPhone which calculates how much water a person of a particular weight needs and I try to hit that amount every day (I usually get graded a B. Heh. ).